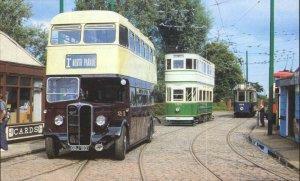 East Anglia Transport Museum01502 518459work Museum - TransportA wide range of historic vehicles on show includes trams, trolleybuses, motor buses, steam rollers, cars, lorries and taxi. There is also a 2ft-gauge railway. Visitors can ride on many of the vehicles and also view the period street furniture and many small exhibits gathered in a developing street scene. The museum is closed on Mondays and Fridays and opens on Tuesdays and Wednesdays during the school holidays. A wide range of historic vehicles on show includes trams, trolleybuses, motor buses, steam rollers, cars, lorries and taxi. There is also a 2ft-gauge railway. Visitors can ride on many of the vehicles and also view the period street furniture and many small exhibits gathered in a developing street scene. The disabled access is limited. Please visit www.eatm.org.uk for admission times. Discounted rates of Adults £8, OAP's £6, Children (5-15) £5 are available for parties of 10 people or more, though are not available on Special Event Days. We are situated just 3 miles south-west of Lowestoft, just off the A146 Lowestoft to Norwich Road. There are brown tourist signs from Lowestoft Town Centre, Oulton Broad and Carlton Colville itself. First Service X22 from Lowestoft Bus Station & Beccles Old Market to the Transport Museum every 30 minutes Monday to Saturday (No Sunday service) Sundays; First service 103 hourly from Lowestoft Bus station to the museum. First Service X2 & Anglian service 146 linking Lowestoft and Norwich via Beccles operates every 30 minutes Monday to Saturday (Service X2 Sunday service operates every hour. Services X2 and 146 stop at the Carlton Crown Public House which is approximately 5 minutes walk away from the museum along Chapel Road.